Also known as Mandala Wisata Wanara wana in local Sanskri language, this forest sanctuary is a secluded and beautiful resort for monkeys. The green foliage and the breezy walking path makes you want to visit this forest again and again. There are around 140 macaques in the forest that happily call it a home and you get to feed them and observe their daily life. There are actually 3 holy temples within its compound. The closest one to the entrance gate is Pura Prajapati which is used for cremation ceremony for the deceased. A little walk further will bring you to the staircase that leads you down to the Holy Bathing Temple at the nearby stream. The most important temple is probably the Pura Dalem Agung which is a local temple for Padangtegal villagers. During my visit, there was a ceremony being held at Pura Dalem Agung. Monkey forest is added in Bali itinerary 2 days and Bali itinerary 5 days. 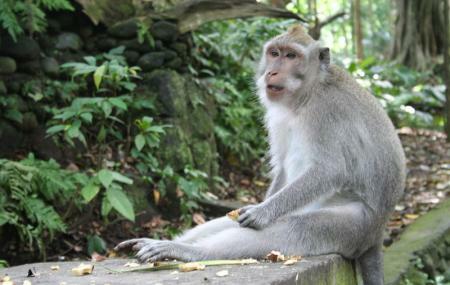 The Monkey Forest in Bali is a sanctuary especially for macaque monkeys of the area. This forested area also has a number of temples in its complex. Monkey Forest ticket prices are not very expensive but because of the popularity of the attraction expect a lot of people waiting in queues. Buy tickets for Monkey Forest online to not waste any time in lines. Monkey Forest tickets can also be purchased in combination with tickets for Monkey Forest tours for attractive discounts and offers. Make sure you tick Monkey Forest in Bali trip planner to understand transit and time to visit. Be careful while feeding the monkeys as they tend to be violent at times. Some part of the forest, like the temple area is not accessible for public visit. it is only available for who are willing to pray and wear proper Balinese praying dress. How popular is Monkey Forest? People normally club together Bali Zoo and Puri Saren Palace while planning their visit to Monkey Forest. Love the nature here. We can see the monkeys being fed by the guides, and they're roaming free around. But we're restricted to have direct physical contact with them. It is indeed a 'sacred' place, here I'm having my very first experience to feel the overflowing energy of this place that made my head dizzy once I stepped in here. Especially the place that was in lower level close to the river. It's a great experience tho. As a guest we should 'honor' this 'sacred' place. Worth the money. Nice walk in the jungle type reservation. Monkeys everywhere and even the cute little baby monkeys are able to be observed. Multiple entrances/exits. Large river that runs through, able to cross walking over some bridges. A few temples that were off limits. All employees were friendly and helpful. Amazing forest filled with monkeys. One of the best tourist attractions I've been to. Hundres of cute monkeys as well as really beautiful nature. Takes easily few hours to go around the forest. A lot of walking but it's worth it. Forest blocks the sun, so it's not that hot in the summer.